The deployment is part of the theater security package in support of the Operation Atlantic Resolve. 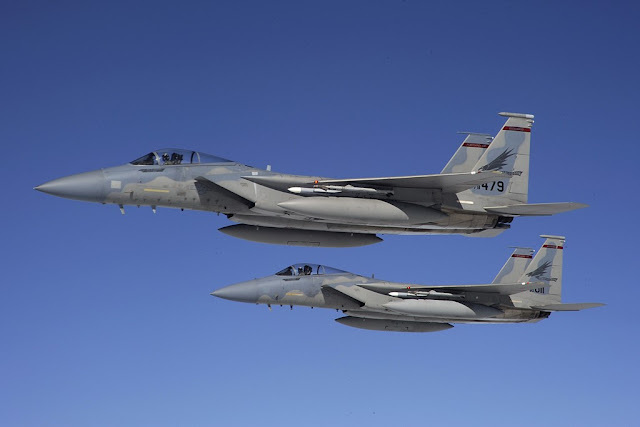 USAF deploys F-15 Eagles to the Netherlands. The U.S. Air Force deployed F-15s from the 142nd Fighter Wing, Portland, Oregon, and the 104th Fighter Wing, Westfield, Massachusetts, to Leeuwarden Air Base, Netherlands, as part of a Theater Security Package in support of Operation Atlantic Resolve. Since 2015, the U.S. Air Force schedules and deploys force packages of fighters and tankers throughout the U.S. European Command area of responsibility. TSP deployments to Europe vary in length and are supported with total force aircraft and Airmen from stateside units. Once in theater, the aircraft will forward deploy to multiple locations throughout the theater, participating in exercises and training with our allies and partners. This highlights the United States' ability to deploy fighter aircraft to support our partners and allies in the European theater, and around the world.